Select the Enable application-aware image processing check box. Click the Customize Applications button. To customize settings of a machine added to the job as part of a container, the machine should be included in the list as a standalone instance. For that, click Add Machine and select a machine whose settings you want to customize. Next, select the machine in the list and click Edit to define the necessary custom settings. To discard custom settings of a machine, select the machine in the list and click Remove. Configure the necessary settings for the selected application server, as described in the paragraphs that follow. Select Require successful application processing (default option) if you want Veeam Backup & Replication to stop the backup job if any error occurs. Select Ignore application processing failures if you want to continue backing up the machines even if errors occur. This option is recommended to guarantee completion of the job. The created backup image will not be transactionally consistent, but rather crash-consistent. Select Disable application processing if you do not want to enable quiescencing for the machines at all. In this case, log processing settings (the section below) will become unavailable. 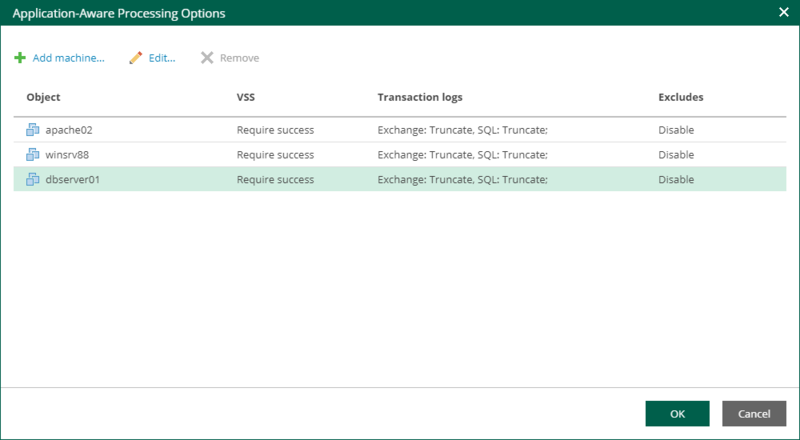 Truncation of transaction logs for Microsoft Exchange server will be performed after the job completes successfully: the Veeam runtime process will wait for the machine backup to complete and then trigger truncation of transaction logs. If truncation of transaction logs is not possible for some reason, the logs will remain untouched in the machine guest OS until the next start of the Veeam runtime process. Settings for SQL Server transaction log handling can be configured separately on the SQL tab — it becomes available to you with this option selected. Similarly, you can configure settings for Oracle database archived logs processing on the Oracle tab. Select Perform copy only (lets another application use logs) if you want to use native application means or a third-party tool to process transaction logs. Veeam Backup & Replication will create a copy-only backup for the selected machine. The copy-only backup preserves a chain of full/differential backup files and transaction logs, so Veeam Backup & Replication will not trigger transaction log truncation. This option is recommended if you are using another backup tool to perform the machine guest-level backup, and this tool maintains consistency of the database state. To learn more, see the Guest Processing section of the Veeam Backup & Replication User Guide. With this option selected, the SQL and Oracle tabs will not be available. For more information on configuring Microsoft SQL Server processing settings, see Backup and Restore of Microsoft SQL Server Databases. 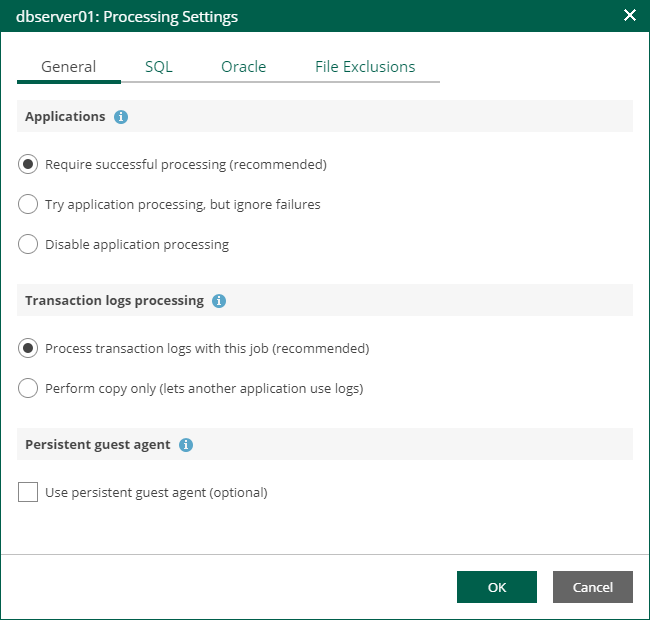 For more information on configuring Oracle processing settings, see Backup and Restore of Oracle Databases. On the File Exclusions tab, specify whether to exclude or include specific files in the backup. Exclusions can help to decrease the backup file size. 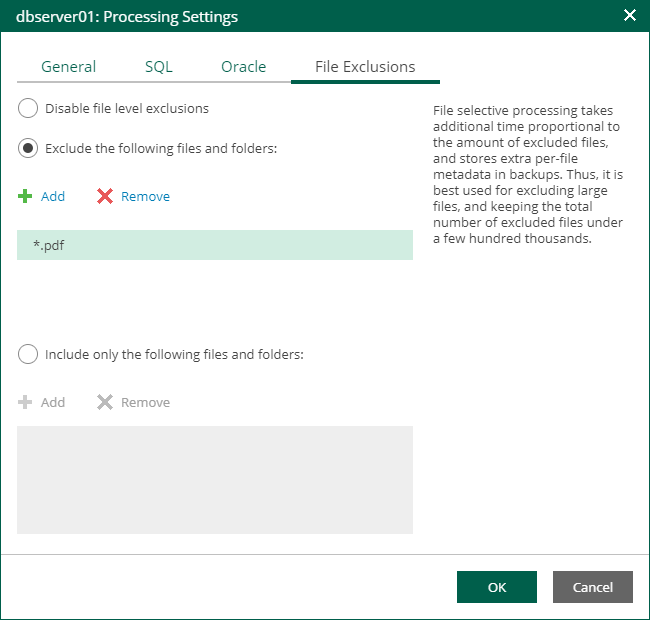 However, remember that selective processing takes additional time that depends on the number of excluded files; also, it requires obtaining per-file metadata (stored in backups). Thus, it is recommended to use this option for excluding large files. By default, exclusions are disabled. Exclude the following files and folders — with this option selected, you can specify what files and folders must be excluded from the backup. Include only the following files and folders — with this option selected, you can specify exactly what files and folders must be only included in the backup. Click Add and specify what files and folders you want to include or exclude. To form the list of exclusions or inclusions, you can use full paths to files and folders, environmental variables and file masks with the asterisk (*) and question mark (?) characters. For more information, see VM Guest OS File Exclusion section of the Veeam Backup & Replication User Guide.